I would certainly recommend this trip to others. The driver was very friendly and informative and it was established a rapport with everyone. The only criticism is that when he talk to the passengers in the mini bus, he turned his hand around and removed his eyes from the road. Our driver/guide Amy drove us safely to Roslyn Chapel where we paid for a visit to the grounds, which included a short tour with a guide. She then walked us to the ruins of a castle situated next to a stream and county park, Roslyn Glen. Along the way she gave commentary and answered our questions. She played Scottish music, too. 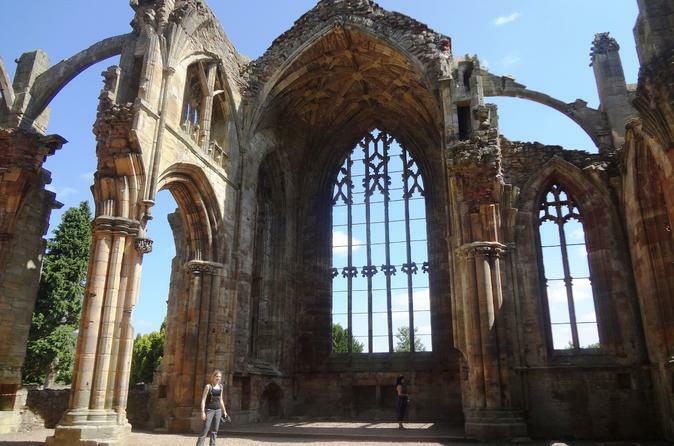 We drove to Melrose Abbey where we paid for a visit to the grounds which included an audio guide. Climb the steps to the lookout in the abbey where you can get a close-up view of the bagpipe playing pig and dog gargoyles, and a scenic view of the abbey from above. We had time for lunch in the quaint town and then drove back to Edinburgh after stopping at a scenic view of the lowlands. The tour stops and starts near the North Bridge. Excellent trip. Another 15 to 30 minutes in each place would have been nice but overall loved it. Driver Bob was excellent . I definitely would recommend this tour--I only gave it 4 stars, because we only spent a little over an hour at Roselyn Chapel and would have loved to stay longer--it was not enough time. The guide was entertaining and knowledgeable--booked through Viator and Rabbies was the name of the tour company--definitely recommend them! Very good trip to Roselyn chapel. Tour guide Adam was informative and helpful. Would recommend this tour to friends. Such a great tour! The chapel was AMAZING! Loved it. Great tour! Our driver/guide was excellent. 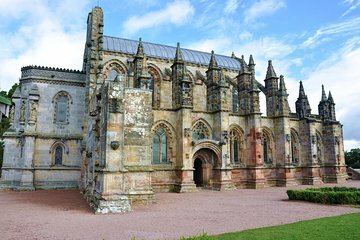 Only complaint is amount of time at Roslyn Chapel - could have used additional 30 minutes. I had really looked forward to this tour and was not disappointed. Mr. Creighton the tour guide was very informative and funny with a lot of knowledge of the area and the history. Loved Scott's View - what a wonderful vista of the countryside! Rosslyn Chapel did not disappoint, either. What a beautiful old church. So much history and so many beautiful carvings. Well worth the day to see all this.